"My website is the most accurate reflection of my personal brand I could have ever imagined. They've captured the essence of my work in radio, and that puts me far ahead of the competition in the media world. After years of working with the best of the best, I can simply tell you that Velvet Green Creations is in a league of their own. Chris and Gina Harman are truly website wizards." "We want to say many thanks for your time, knowledge and creativity. We feel we got the best website to represent our type of work. I like to share desicions with our children Lee and Rebbecca, they are becoming great leaders. Again, we could not of gotten better services than yours. We are very happy and excited. We are looking forward to the results that we will be getting. Also thankyou to all that are involved with you. Hope you and your family enjoyed the salmon. See you in the future." 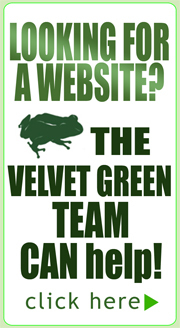 "Debbie and I decided to improve our web site this winter and we were blessed to use Velvet Green ( Chris and Gina Harman) to get this project completed. We (namingly Zeak) have been going to take this on internaly, for several years now, and af course have not finished any thing. We decided to attack this project the same way we would when we complete your projects. We hired the best ( Velvet Green Creations) and so far I think that Deb and Gina have done a great job!" "The web page looks fantastic! I am really surprised at how much content you were able to put on there with the little information we were able to get to you. I think it is great that you put some video clips in there, that is a wonderful touch, and something you don't see very often on web pages in our genre. Thanks for all your work,"
"This is the one! It's absolutely perfect and better than I ever imagined it could be! I'm so excited! I also like the idea of the simplified version for small items. Thanks again!" “This year I had the distinct honor to work with Chris and Gina Harman, owners of Velvet Green Creations. Never in more than twenty-five years of doing business have I worked with such talented, integral, creative, loving, kind people. Their creative talent knows no bounds. Their willingness to go wherever you need them to go with grace and love never ceased to amaze me. People from all over the country have been awed, inspired and moved to action as a result of my website." "I have had the pleasure to work with Chris and Gina Harman of Velvet Green Creations in the development of the website for my land surveying business. I am amazed at the knowledge and talent within their company. I am also impressed with the customer service that I receive. I am a firm believer in specialization and trade; I focus on what I do best and I let other professionals in different disciplines help me when necessary. This philosophy has definitely paid off by working with Chris and Gina. Much of my business is generated from my website. Quite honesty, Velvet Green Creations makes me look good. I look forward to continuing my relationship with the Harmans." "The purpose of my letter is to introduce you to Velvet Green Creations, more specifically to the very talented and creative co-owners, Chris and Gina Harman. If you are looking to create your first web site or to freshen-up your existing site, look no further. Chris and Gina can take your idea and turn it into a real work of art that will not only represent you and your business ideals, their web-site creation will bring clients to your door. That is what your looking for isn't it, to bring more potential customers to your place of business? Don't take my word for it, go ahead and tell Chris or Gina I sent you and set back to watch the results happen. Trust me on this one you won't be sorry!" "Last year we spent a lot of money on advertising in the Detroit Free Press and various Upper Peninsula newspapers and we lost a lot of money. This year, within 6 weeks of being online through www.superiorsights.com, we sold 6 puppies with more pending. One of our customers from Alpena, Michigan commented to us that our site was the best web pages that he had ever seen. Just had to email you and tell you how excited I am that our new website is up and running. It is absolutely beautiful and I am so satisfied with your work. I love the way you incorporated our photos and words to make our site absolutely outstanding. You were both the greatest to work with and your ideas were "right on target". Your artistic flare and website knowledge are a wonderful combination. I struggled to find the right "look" on my own for years with my old website and just want you to know that hiring Velvet Green Creations was a really smart move. Your business will grow from recommendations and business will grow because I have such a beautiful well organized website." "The Harmans artistic vision shows in every page of our web site. We have received many comments regarding the professional but user friendly site that Chris and Gina designed for us. We are pleased with its results and very fortunate to be working with them. I would recommend their services to others." "I just wanted to thank you for all your help creating my website. You made great suggestions, and the website is better than I ever expected. I'm sure it will be a great boost in reaching out to new customers."